Need to install or upgrade your MD or DC access control system? At King Door and Lock Maryland and DC, our access control system installation and repair services are among the best in the industry. You have sensitive data in certain parts of your business and you only want qualified personnel to have access to those areas. We can install any type of access control system you require. Systems where the employee swipes an access card or those where they punch in a code on a keypad are available. We can also install and repair secure access systems that require the use of key fobs. At King Door and Lock Maryland and DC, we make it our business to help your business with all of your access control needs. Our technicians are highly trained door, lock and access system experts who can handle any job from the routine to the most sophisticated. We replace, repair and install these systems for government buildings, supermarkets, malls, offices, condominium entrances, and just about any other type of commercial enterprise. 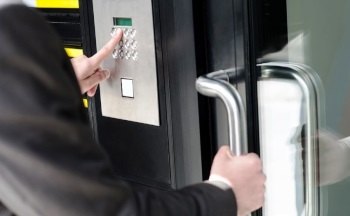 For this type of service, we specialize in installing keyless entry systems in MD and DC that may involve the use of a fob, or key card or a keypad on which a unique code is entered to gain access. We pride ourselves on our fast and friendly staff and ’round the clock availability of our 24/7 door services. 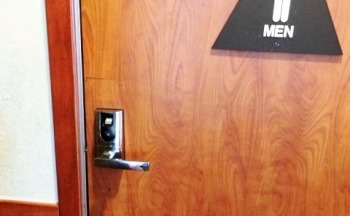 We specialize in providing entry and exit solutions with our commercial door services. We will take care of your doors, locks, as well as install and repair access control systems. Our trained technicians have the door hardware required when they come to your business to handle any job you need done. For an installation, we will assess what type of access control system may be best for your building and make whatever recommendations that will augment the security of your facility in a cost-effective manner. If you already know the type of system you plan to use, we can provide you with our competitive rates and up front pricing, so you will know you are making a sound business decision when hiring our services. If you currently have an access control solution in place but it is no longer functioning properly, definitely give us a call for that as well. Our experienced techs will get to the heart of the problem with their high tech equipment and tools and will tell you what it will cost to fix. In situations where an existing system has failed, replacement may be another option. If your current access control system is very old, it may need to be replaced. Our trained techs can assess whether repair or replacement is the best solution for your specific situation. At King Door and Lock Maryland and DC we put our customers first. In providing our 24/7 door services we offer up front pricing, highly trained door, lock, and access control experts, as well as competitive rates throughout the Maryland and Washington D.C. areas. If you need an access control solution for your business, call us today so we can fix your problem quickly, competently, and cost effectively. Experts at Installing and Repairing Access Control Systems! Access Control Systems https://kingdoorandlock.com/access-control-systems/ 4.1/5 based upon 27 reviews.